These past few weeks have been a bit slow in the sense of ‘I’m not at the shop as frequently as busy wedding season’. But if you know me, I have two tiny humans - both 1 year old (until Abel turns 2) next week. So slow sense of life is not even a thing. (Ha) It’s crazy, full, & fun. if you could see my heart right now, you know it’s bursting- with all the kinds of joy getting to be home with my hunnies for a good chunk of the week. Working from home with little babies means late (and I mean late) nights, because that nap time- time slot is filled up fast - you know with dishes & laundry.. I’m slowing morphing into my late night loving business partner; coming from the 9pm bedtime gal. But, in this season- it’s working. By the time my ‘in shop’ work days come, I’m ready to get to work & get creative in that way- with my favorite r&r gals! In relation to my life, I can look back & see how much I’ve grown. Especially in these roles of business ownership & motherhood over the last few years. But there are times when I’ve felt dry in my creativity & tired in my roles. Although it’s all a blessing, burnout shows no mercy. And, also times where I gave myself time to just be watered; to take a real day off, soak in to my sweet family, read, praise god, ride my bike, play in the garden, and learn more about my craft. all things that give me life & make my heart happy. which in turn, make me THRive! By doing this, really feel the effect of growth. To see it play out & reflect on how important it is for self care. As wives, mamas, business owners and women we are pouring out a lot of ourselves. usually for others, which is a beautiful yet exhausting thing. - our to do list is ever growing. With these roles naturally come those responsibilities. 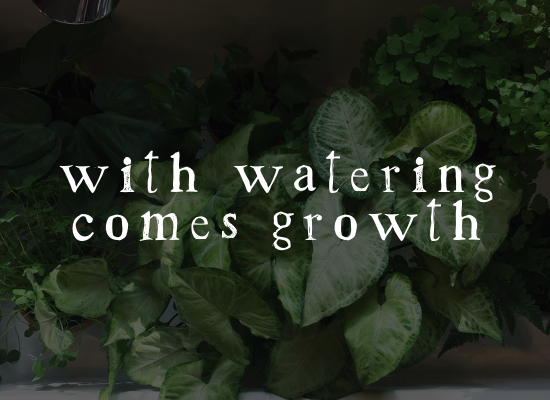 for me, I want to be intentionally walking into this next season of Spring & wedding season, with a reminder to take time to be watered. to not wait til i’m bone dry to do so. To make time for myself & the things that bring me true joy, because with that life is lived & lived well.